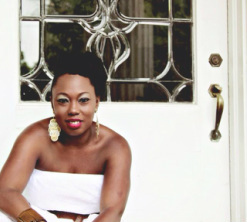 Carolina BORN AND Memphis RAISED, Shenette Swann attributes her soulful combinations to her southern roots. As a classically trained vocalist, Shenette brings a captivating variety to her live shows. She's an entertainer for the Life and Science Museum of Durham, NC- an Interactive children's entertainer for Wake county libraries and Marbles Kids Museum-Raleigh and a Jazz/blues vocalist. Swann was trained in New York under the legendary and world renowned jazz vocalist and educator-Bobby McFerrin and loves to train and coach other young vocalist. Her love for community wholeness is strongly displayed in her freedom style songwriting lyrics, earning her the title..."The motivational Singer". Shenette Swann is a motivational speaker/a human rights advocate and Narrative life coach, using journaling, meditation and music to empower her clients. SPARK WONDER AND NEW NARRAITVES (S.W.A.N.N.) is her coaching business located in Raleigh, NC. Shenette's music can be found on iTunes, Amazon and Spotify. Order her new cd on the Singer page with a donation of $15 that goes toward her youth client sessions. A Woman of Many Hats, Shenette Swann is a public figure that stands out in all she does! Shenette "SWANN" has an electrifying magnetism that captivates her audience. Contact Shenette Swann to schedule a Narrative life coaching meeting. Click the Swann to learn more. Take a look at some of Shenette's work below! Shenette Swann is a Speaker in the community for Interact, a non profit United Way organization that provides safety, support, and awareness for women and children who have been or are now currently victims of domestic or sexual violence. Learn more about how you can tour the Interact facility to experience the life changing ways This powerful organization helps to restructure and rebuild brokenness.